Escapism and crazy, quirky adventures in Wilkie Martin’s unhuman series. 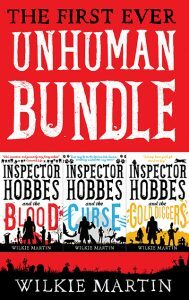 If you are looking for a new fantasy series or a light, funny read, then this unhuman bundle or collection will show why Wilkie has a cult following for his cozy mystery crime fantasies. Inspector Hobbes, a monstrous police detective, investigates grave, ghoulish, goings-on. A mad pseudo vampire with the dagger of Vlad Tepes is behind robbery, and murder. It is a funny tale with a troll, human sacrifice, blood and great cooking. Andy becomes infatuated with a dangerously beautiful woman during Hobbes’s investigations into sheep deaths and the mysterious disappearance of pheasants, which are apparently connected to a rash of big cat sightings; and something horrible seems to be lurking in the woods. Unwelcome Attention after foiling an armed robbery forces the Inspector away on holiday to the dangerous Blacker Mountains, where his accident-prone friend. Andy stumbles across something shocking, before falling for an attractive widow.